Read more here. Check out the syllabus here. if you’re a millionaire, February 16th is the last day that you will pay into the social security for the entire year. That’s because the Federal payroll tax cap is set at $127,000, so any money made beyond this point, is not subject to taxation that would fund this very crucial Federal social program. See Real News Network interview with Dean Baker of the Center for Economic Policy Research here. 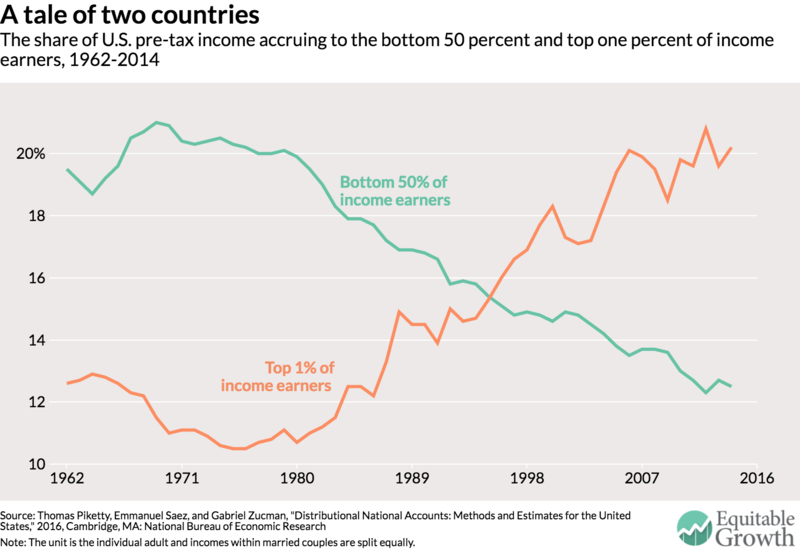 Source: “Economic growth in the United States: A tale of two countries,” by Thomas Piketty, Emmanuel Saez and Gabriel Zucman for the Washington Center for Equitable Growth. Here are the 50 states, ranked from “most shortchanged” to “least shortchanged” by the U.S. government. The ranking is based on an index combining: (i) votes in the Electoral College per state resident and (ii) benefits received per tax dollars paid to the federal government. Politicians were piling on this week to criticize the deal, including Donald J. Trump; Tim Kaine, the Democratic nominee for vice president; and Senators Bernie Sanders of Vermont and Al Franken of Minnesota…. A younger generation of antitrust scholars who are rethinking the nation’s fundamental approach to antitrust law may prove even more influential. In vertical mergers, a company buys a supplier; in horizontal mergers, direct competitors combine. But the new generation harks back to the original trustbusters of the early 20th century, who were most concerned about preventing corporations from gaining too much power. Read more here. For more on corporate pursuit of power, see this piece by Econ4’s James Boyce. When I first saw this, I thought it must be a typo. Incredibly, it’s not. Read more here. And here. And here. You can download the Inspector General’s report that uncovered the mess here. Where the trade agreements failed, it was not because the US was outsmarted by its trading partners; it was because the US trade agenda was shaped by corporate interests…. We need to rewrite the rules of the economy once again, this time to ensure that ordinary citizens benefit. Politicians in the US and elsewhere who ignore this lesson will be held accountable. Change entails risk. But the Trump phenomenon – and more than a few similar political developments in Europe – has revealed the far greater risks entailed by failing to heed this message: societies divided, democracies undermined, and economies weakened.